Councilman Joe Martinez at his swearing in. Photo by Jennifer Jean Miller. 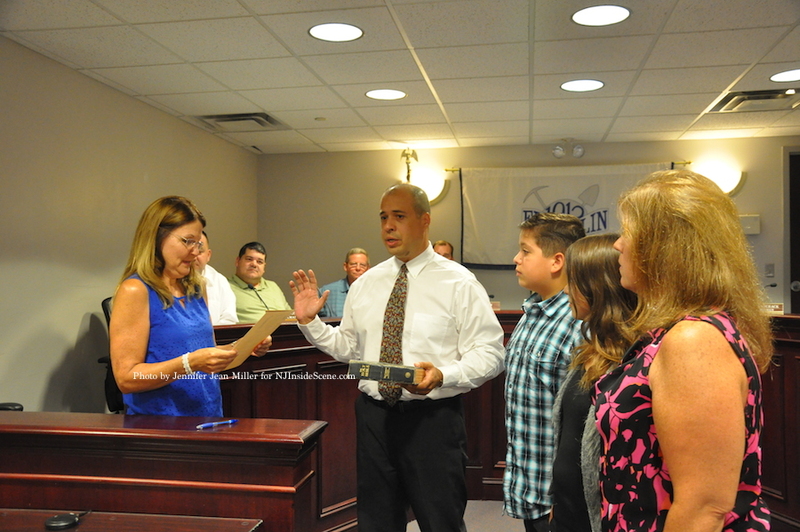 FRANKLIN BOROUGH, NJ – Joe Martinez is the newly appointed councilman in Franklin Borough, after the resignation of former councilman David Fanale on July 9. 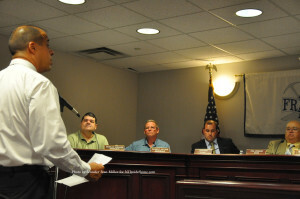 He was chosen on Tuesday, August 5 at a special council meeting. Martinez was one of three nominees that the County Republican Committee nominated to fill the seat. Dawn Fantasia and Michael Rathbun were the other two. Councilman Joe Martinez takes his seat on the council. Photo by Jennifer Jean Miller. Martinez was chosen three to two in the votes, with councilman Nick Giordano nominating him, and councilman Gilbert Snyder seconding the nomination. 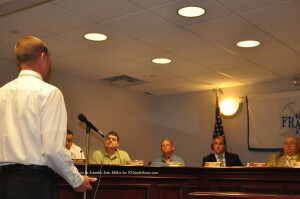 Councilman Fred Babcock nominated Fantasia. After Martinez was chosen, he was sworn in with his family, and then took his seat on the end next to Babcock, where Fanale had been previously seated. Each candidate had an opportunity to speak publicly before the decision was made. The first to speak was Fantasia. 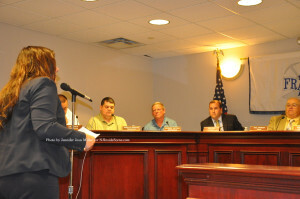 Dawn Fantasia addresses the council. Photo by Jennifer Jean Miller. “If you put me on this council, we will move mountains, gentleman,” Fantasia told them. Fantasia’s background is in education, and is the Director of Assessment and Humanities at the North Jersey Arts and Science Charter Schools in Elmwood Park. She is a district representative to the NJ Department of Education for six schools in Bergen and Passaic Counties that the school she works with covers in its district. She served on the Republican County Committee for Hardyston Township. Martinez, who was next to speak, said he and his family have lived in the county for over 20 years. Joe Martinez takes his turn to speak in front of the council. Photo by Jennifer Jean Miller. “We have been active in the community since we got here,” he said. He is the chair of the Recreation Committee, for which he has served many years, and is also involved with the Zoning Board. He described his family as being active in putting on events in town, including concerts and movies in the park. He said that he and his family built the screen now used for the movies in the park. His son is also a member of the Wallkill Valley First Aid Squad. His older son is a Marine. Martinez has been very active in a revitalization plan for the pond area. “We’re the ‘Mineral Capital of the World,’ we need to revitalize that,” he said. An initiative more on a personal scale, he described, was assisting a resident who lives near the baseball field, and has contended with windows breaking each year. He said a net system was implemented and the citizen is now able to enjoy his home without further damage to the windows. “It’s time to get the community back together,” Rathbun said. Michael Rathbun was the last of the three council member candidates to speak. Photo by Jennifer Jean Miller. Like Martinez, he is involved with the Recreation Committee and has coached girls’ softball. He works for the Morris County Municipal Utilities Authority (MUA). He said his job involves overseeing contracts, including one for $356 million. “I’m very familiar with government contracts and regulations,” he said. He described his platform as similar to Martinez’s, with his desire to seek revitalization to the pond area, as well as to adding back more businesses to the Route 23 corridor. 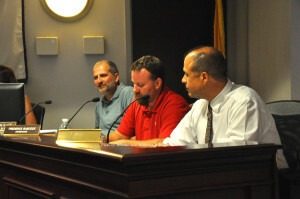 Council members, before and after the candidates were chosen, noted how challenging their decision was. Stay on the scene for NJInsideScene.com, and click here to follow us on Facebook.